Here are ten facts about Framlingham Castle. Framlingham Castle is located in the town of Framlingham, Suffolk (England). The first castle on the site was a Norman motte and bailey castle, but this was destroyed during a revolt against Henry II from 1173 – 1174. A new castle was built in the late 12th century, on the same site, by Roger Bigod, the Earl of Norfolk. Framlingham Castle doesn’t have a keep. It consists of a curtain wall with thirteen towers. In 1216, Framlingham Castle was successfully besieged by King John because Roger Bigod had opposed the King during the First Barons War. Framlingham Castle was modernised by John Howard during the Tudor period. Ornamental chimneys were added, brickwork was used to improve the original stonework, and pleasure gardens were created. In the seventeenth century, Framlingham Castle wasn’t used as a residence and it started to fall into disrepair. It was used in 1666 as a place to isolate those people suffering from the plague. During the Napoleonic Wars it was used as an equipment store. Pembroke College in Cambridge owned Framlingham Castle during the seventeenth, eighteenth and nineteenth centuries. 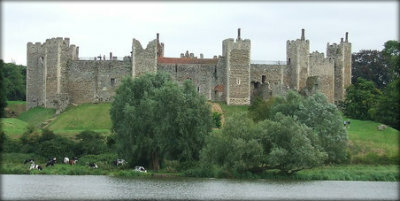 During this time, Framlingham Castle was the location of several poorhouses. Framlingham Castle featured in the plans drawn up to defend England if an invasion took place during World War 2. Framlingham Castle is now owned by English Heritage and is one of the key tourist attractions in Suffolk. What next? Discover more castle facts by visiting the Primary Facts castles resources page.